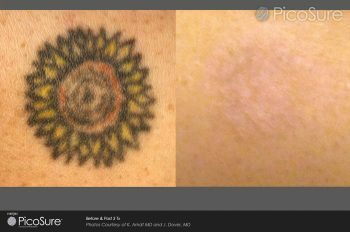 Home > Blog > How much is tattoo removal? You may have been looking at your unwanted tattoo for a while now and wondering what to do. If you have started your research for getting it removed you will have found to your relief that it is totally possible to get your tattoo removed safely and with no side effects by using Laser tattoo removal. With that in mind you may be wondering how much is tattoo removal? First of all let me say it is not a super cheap undertaking. You will need a series of treatments and it is with a high tech machine and professional practitioner which of course means that the price corresponds with that. If you are thinking of looking into a much cheaper method such as tattoo removal creams I suggest you read our blogs and research them because it is not worth it! Spend that bit of extra money now and it will all be worth it when you have a smooth scar free area of skin where your tattoo used to be. So let’s look at prices. Pulse Light Clinic is a very professional clinic with a lot of experience in tattoo removal and on top of that they are using the most up-to-date laser the PicoSure machine which many clinics have not yet upgraded to. Here is a list of their package prices. Buying in bulk is always the best way to go for tattoo removal as one treatment is not going to remove your tattoo and you get a discount with the packages. This is a list of a package of four treatments. Compared to the price of a single treatment you are getting your fourth treatment completely free. In some cases four treatments could be enough to remove your tattoo entirely. Go in for a free consultation and they can tell you which size your tattoo fits under and how many treatments they recommend for for full removal of your tattoo. The reason it varies is the colour of the ink used, how old the tattoo is and your skin colour so don’t be afraid to ask lots of questions! I hope that give you a basic idea of how much is tattoo removal really? Click this page, to find out more information about laser tattoo removal treatments.